The internet reserves a special level of frenzy for anything that involves Barack Obama or Joe Biden individually, but there seems to be something about the bromance between the two that many hold even more dear. And apparently it's no different for the two former White House officials when throwback photos are thrown into the mix. 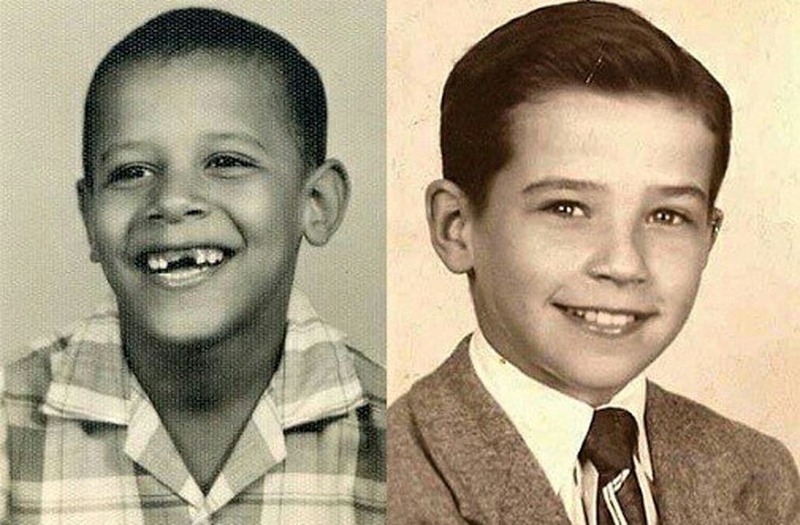 On Monday, Reddit revived two old photographs from Obama and Biden's childhood. 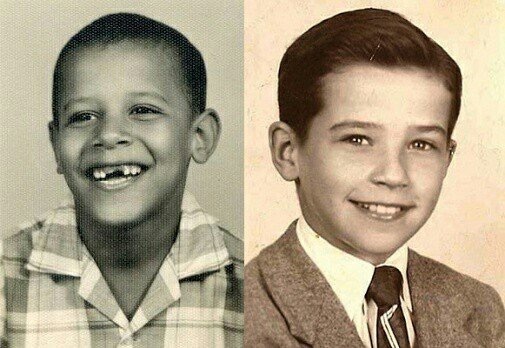 The first photo shows a young, grinning Obama with two front teeth missing in a plaid button up. The second, a photo of a fresh-faced Biden with a slicked side part, suited up. US President-elect Sen. Barack Obama (D-Illinois) and Vice President-elect Joe Biden (D-Delaware) wave to supporters during their election-night rally after being declared the winners of the 2008 US presidential campaign in Chicago on November 4, 2008. Obama and Biden walk to the motorcade on the South Lawn of the White House for departure en route to the US Capitol for a St. Patrick's Day lunch. Biden and Obama look at an app on an iPhone in the Outer Oval Office. Obama has lunch with Biden on the Oval Office patio on June 28, 2012. Obama, with Biden, conducts a conference call with Rob Nabors, deputy chief of staff for policy, and Senate Majority Leader Harry Reid to discuss the federal-government shutdown and debt ceiling. Obama talks with Biden and Chief of Staff Jack Lew in the Oval Office on July 26, 2012. Obama and Biden pose in the Blue Room of the White House on May 10, 2010. Biden points to Obama while Obama delivered his final State of the Union address on January 12, 2016. Obama and Biden head toward the Oval Office private dining room for lunch on May 4, 2011. Obama hugs Biden after delivering the eulogy in honor of Biden's son, former Delaware Attorney General Beau Biden. Obama and Biden walk around the South Lawn of the White House on July 24, 2011. Obama embraces Biden in the Oval Office after a meeting on the budget on April 8, 2011. The Obamas joke with the Bidens in the Blue Room of the White House before the National Governors Association Dinner. Obama and Biden wait for their lunch during an unannounced visit to Ray's Hell Burger in Arlington, Virginia. Obama and Biden participate in a "Let's Move!" video taping on the Colonnade of the White House on February 21, 2014. Obama and Biden share a laugh in the Oval Office. Obama smiles at Biden during a meeting in the Oval Office. Obama and Biden practice their putting on the White House putting green on April 24, 2009. Obama, Biden, and Claire Duncan, daughter of then Education Secretary Arne Duncan, watch a tennis match at Camp David, Maryland, on October 3, 2010. Obama walks with Biden along the Colonnade. Biden arrives for a meeting with Obama, then Secretary of State Hillary Rodham Clinton, and then National Security Adviser Tom Donilon in the Oval Office on July 18, 2012. Obama and Biden shake hands in the Oval Office following a phone call with House Speaker John Boehner securing a bipartisan deal to reduce the nation's deficit and avoid default. Obama jokes with Biden in the Oval Office on December 21, 2010. Obama walks across the tarmac with Vice President Joe Biden before departing from Fort Campbell, Kentucky. Obama jokes with Biden backstage before the STOCK Act signing event in the Eisenhower Executive Office Building's South Court Auditorium on April 4, 2012. Obama and Biden react during a lighter moment at the daily economic briefing in the Oval Office on July 30, 2009. Obama and Biden high-five after watching Sasha Obama and Maisy Biden, the vice president's granddaughter, play in a basketball game in Chevy Chase, Maryland, on February 27, 2010. Obama gestures with Biden after his election-night victory speech in Chicago on November 6, 2012. Obama and Biden walk back to the Oval Office after putting on the White House putting green on April 24, 2009. Obama and Biden share a laugh in the Oval Office on July 21, 2014. Obama turns down Biden's offer to buy his lunch at a sandwich shop near the White House in Washington, DC, on October 4, 2013. Obama and Biden walk arm in arm before speaking at the Chrysler Transmission Plant. The Obamas embrace the Bidens moments after the television networks called the election in their favor, while watching election returns at the Fairmont Chicago Millennium Park in Chicago. Obama fist-bumps Biden, as Senior Adviser Valerie Jarrett looks on, before a meeting in the Oval Office on September 16, 2010. Obama and Biden walk back to the Oval Office after speaking about the US Supreme Court ruling to uphold the nationwide availability of tax subsidies under Obamacare. Obama, Biden, and the first lady talk in the Blue Room of the White House before hosting a reception in honor of Jewish American Heritage Month on May 27, 2010. Obama and Biden participate in a "Let's Move!" video taping on the Colonnade of the White House. Obama laughs with Biden and Senior Adviser David Plouffe in the Outer Oval Office on April 26, 2012. Obama listens to Biden in the Oval Office. Obama and Biden wait in the Green Room of the White House. Obama adjusts Biden's American-flag pin as they wait in the Oval Office with Jeh Johnson before announcing Johnson as the nominee for secretary of the US Department of Homeland Security on October 18, 2013. Obama and Biden wait to be introduced before the Fatherhood Town Hall at the White House on June 19, 2009. Obama and Biden speak in the hallway outside the Oval Office following a meeting on November 26, 2012. In epic Reddit fashion, the photo garnered about 400 reactions in less than 24 hours. "Damnit Biden. Did he like come out of the womb looking classy af?!" one Reddit user wrote, while another simply remarked: "Don't you ever sleep on Barry O." The side-by-side photos also inspired comparison between Obama and U.S. President Donald Trump. "Obama was America's dad. Trump is America's mom's abusive boyfriend," one disappointed Reddit user wrote. Another referred to Trump in spirit as the would-be "local bully." Though an age hasn't been confirmed for Obama yet in his picture, Biden is 10 years old in the photo taken, The Daily Herald reported. Is Melania Trump the most reclusive first lady yet?